» TMF Review by William R. Loeser: VICARS BELL – Death and the Night Watches. TMF Review by William R. Loeser: VICARS BELL – Death and the Night Watches. 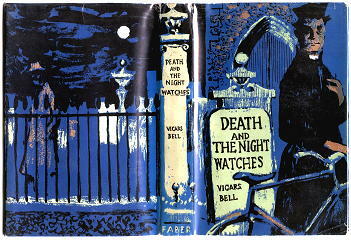 VICARS BELL – Death and the Night Watches. Faber & Faber, UK, hardcover, 1955. Death and the Night Watches by Vicars Bell is another of that enjoyable sub-genre, the English village murder, chock-a-block with well-distinguished local characters, much like The Nine Tailors without Wimsey. Here the detective is Douglas Baynes, an entomologist who lost a leg in World War II, assisting a couple of interesting members of the official staff, and the problem: who shot a local farmer and bully, beat his head to a pulp, and left his body in the churchyard? His death is the greatest relief to his sister, a member of the walking dead, and her daughter, still hopeful and in love. The vicar, a believer in the militant church, thinks her boyfriend did it and tries to cook the evidence. Baynes sees through this and puts the romance back on the tracks, but he and the author can’t figure out who did do the crime. At last, a portion of the cast reveal themselves as villains and, against their best interests, kidnap Baynes, so there can be a smash ending, complete with a boat race and a helicopter. � From The MYSTERY FANcier, Vol. 3, No. 4, July-Aug 1979 (slightly revised). [Editorial PostScript.] This a scarce book. After reading Bill’s review, I went hunting for a copy, and I found one, the cover of which you see above. At the moment I am typing this, there are now none. I’m sure I was the lucky recipient of a bookseller’s error. I paid less than $10. Of Vicars Bell’s six mysteries (see below), only two of them are available online, and one is offered in the $200 range. And not only does mine have the dust jacket, it turns out that it is inscribed by the author to his father in 1955. 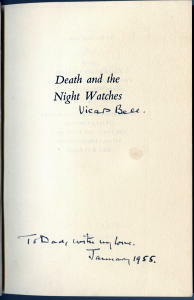 Fifteen books are listed in CA as having been written by Vicars Bell, which sounds like a pseudonym but is not, including the six detective novels previously mentioned. Other work includes such titles as Little Gaddesden: The Story of an English Parish, 1949, and On Learning the English Tongue, 1953. BELL, VICARS (Walker). 1904-1988. Series character, in all titles: Douglas Baynes. Death Under the Stars (n.) Faber 1949. Death Has Two Doors (n.) Faber 1950. Two by Day and One by Night (n.) Faber 1950. Death Darkens Council (n.) Faber 1952. Death and the Night Watches (n.) Faber 1955. Death Walks by the River (n.) Faber 1959. THANK YOU for providing this info, especially the list of books in the Baynes series. It’s hard to find much real content about Bell or this series online.